Srinagar, January 30 (KMS): In occupied Kashmir, a peaceful protest demonstration, organized by the Joint Resistance Leadership, was held in Srinagar, today, to condemn the killings and cordon and search operations carried out by Indian forces in Shopian, Pulwama, Kulgam and Islamabad districts. Srinagar, January 30(KMS): In occupied Kashmir, the Vice Chairman of Jammu and Kashmir Muslim Personal Law Board and Deputy Grand Mufti, Mufti Nasir-ul-Islam has said that it is the time for Indian Muslims to demand a separate country within India. Srinagar, January 30 (KMS): In occupied Kashmir, complete shutdown was observed on the sixth consecutive day, today, in south Kashmir’s Shopian district against the recent civilian killings by Indian troops. Srinagar, January 30 (KMS): In occupied Kashmir, a peaceful protest demonstration was held in Srinagar, today, to condemn the killings and cordon and search operations carried out by Indian forces in Shopian, Pulwama, Kulgam and Islamabad districts. 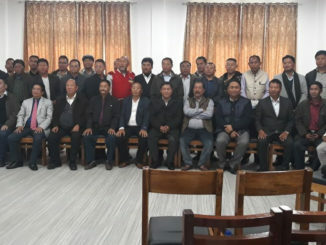 New Delhi, January 30 (KMS): In a major development in India, all political parties of Nagaland have decided to boycott the forthcoming Assembly elections if the political solution to the Naga issue doesn’t reach a conclusion. Srinagar, January 30 (KMS): In occupied Kashmir, Dukhtaran-e-Millat (DeM) has expressed concern over deteriorating health of party Chairperson, Aasiya Andrabi, urging the Kashmiri people to pray for her speedy recovery. Srinagar, January 30 (KMS): In occupied Kashmir, Hurriyat leaders and organizations have pad glowing tributes to a martyred young boy, Wamiq Farooq, on his eighth martyrdom anniversary, today. Srinagar, January 30 (KMS): In occupied Kashmir, the All Parties Hurriyat Conference reacting to the recent assertions of Indian Army Chief and BJP leaders has said that Indian army and political leadership wants to kill every soul in Jammu and Kashmir. New Delhi, January 30 (KMS): A report compiled by the Delhi High Court while confirming inhuman torture on Shahid Yousuf, the son of prominent Kashmiri freedom leader Syed Salahuddin, has said that the prisoners lodged in infamous Tihar Jail are living under constant fear of getting killed on one pretext or the other. Brussels, January 30 (KMS): Kashmir Council European Union (KCEU) has expressed its complete solidarity with the oppressed people of occupied Kashmir.